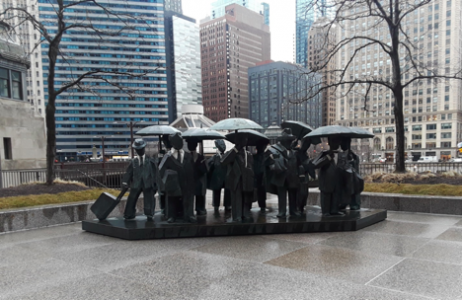 “The Gentlemen,” by Taiwanese sculptor Ju Ming at the AMA Plaza in Chicago. Photo by Lisa Saye. As I write this article, another historic storm has impacted life and property in the Midwest with some outlets reporting that as many as 25 states have faced or will face blizzard-like conditions, heavy snow, hurricane-force winds and massive flooding. Probable outcomes of such devastation will include infrastructure damage, lost crops, weakened homes and buildings and the need for physical and psychological repair. The citizens in the wake of the storm have learned rather quickly that life, schedules, scenery and traditions may never be the same. They will mourn the past as they salvage any water-damaged memories, as well as those items that were fortunate not to blow away in the cyclone’s winds. They will stand, they will move and they will begin to rebuild. It won’t be easy. It won’t be normal. But they won’t be alone. Public servants will be there, running to the disaster, racing to help—come rain or shine. I could not begin to list the number of proverbs, wise sayings and quotes that would be appropriate to mention regarding this event. If I did, any notion of friendship and compassion would do nicely. The United States is gifted with an enormous amount of goodwill and love. It is easy to forget this as one listens to current rhetoric or reads the hostile comments that follow an article on the internet. The United States is at its best when it is at its best. It’s best being its offers of aid and assistance when one of its neighbors is in need. Our compassion for each other is something that cannot be polled or measured along a happiness index. I would say it is something we get right each time we need to. It is something we can build on, something we share and something we take pride in. Like Ju Ming’s sculpture at the AMA Plaza in Chicago, Illinois, our collective heart is permanent and it beats for the service of others in need. The wealth of any nation lies solely in the value its citizens’ place in each other. I am certain that public servants will be called upon to deliver healing, stability and support in the not-so-distant future when life becomes challenging or loss becomes apparent for our citizens. When those instances arise, we must rely on our investment of compassion, coupled with skill, and serve as we are called to do. The United States, although not perfect, has not survived its many challenges by relying on neglect as a default. And we cannot afford to be less decisive now. Our wealth, our bling and all of our riches are evident when we stand arm-in-arm with our friends. In the noise of life, we can often delay beginning to do what comes next or what needs our immediate attention. Speaking of immediacy, I think that public administration needs to capture this moment in time and think about developing our next thought-system. A plethora of questions come to mind when one contemplates conceptualizing a new construct. For answers, we can begin with what we already know. We know that there are a few system-developing covariates that never change from school to school. For example, each time that a new school of thought is built, we incorporate new gateway legislation that points us in our newest direction. Also, each time a new school is built, whereby public administration becomes more defined and public service more designed, we celebrate that we have finally solved the problem. We remark that we have developed a vision that we didn’t know we had and that now we have a sight in solving problems that we didn’t count on. I think that the next thought-system should go a bit further. The next thought-system cannot exclude what we have come to learn about ourselves and that is the extent to which we now recognize how dignity and integrity improve service delivery. For hundreds of years, our single unifying goal has been equality—be it in hiring, in program funding or in representation. Accurate notions of public service are derived from observations of local demographics that dictate public need, bureaucratic growth or shrinkage and methods of public service delivery. The next thought-system must recognize that the citizens are more than just those that we serve. Our next system must acknowledge that citizens are public administration’s auxiliary-force. That force of citizens define, partner with and act as support in the delivery of public services. We must rethink our public and share the institutional role of government as part of empowering ourselves. We have come to know our public as friends and as extensions of ourselves and we are all the richer for it. We cannot do what we do without them and they are our closest and most accurate supervisors. So, when you really think about, our public is family. The Image was taken by Lisa Saye in Chicago, Illinois. ….. the wealth of any Nation lies solely in the value of its citizens place in each other. In fact, public service is a reflection of a culture of society. Public institutions can not provide the distinctive service without the help of the community, it is a kind of integration between all parties to society.